In 2004, while staying in a converted monastery in wild, windy, Avignon, we read an invitation to “bitings on a complimentary basis” at 7pm . In some trepidation we donned evening garb, strung garlic around our necks and descended to the ancient hall for what turned out to be “free nibbles” and not of the flattering, cannibal sort. 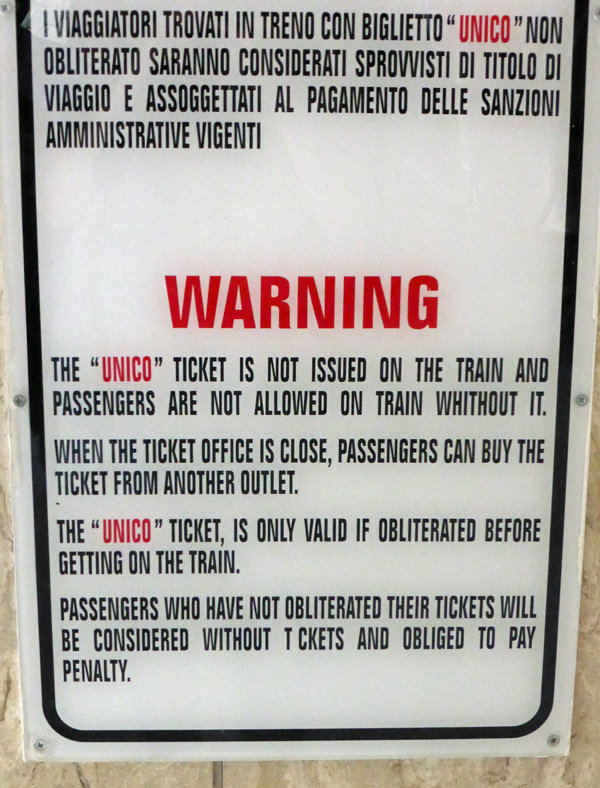 The European grip on English translation had not improved by 2013, when, in the train station at Sorrento we read a sign which frightened and confused us. We wouldn’t dare get on train whithout t ckets; but, although the ticket office was close, we couldn’t see another outlet. And, if we did manage to get t ckets, how best to obliterate them and yet still be allowed on train? 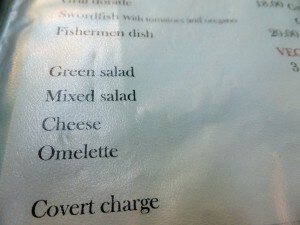 Menus are a joy for the picky English-speaking traveller. 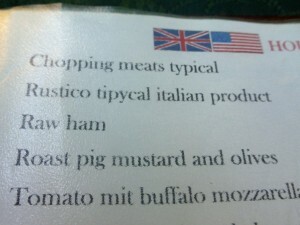 Somewhere in Germany we enjoyed chopping meats typical, a mysterious rustico tipycal Italian product and a fishermen dish. But we drew the line at pig mustard. it was decent, if a little self-defeating, of the restaurateur to warn us that there would be a hidden fee. 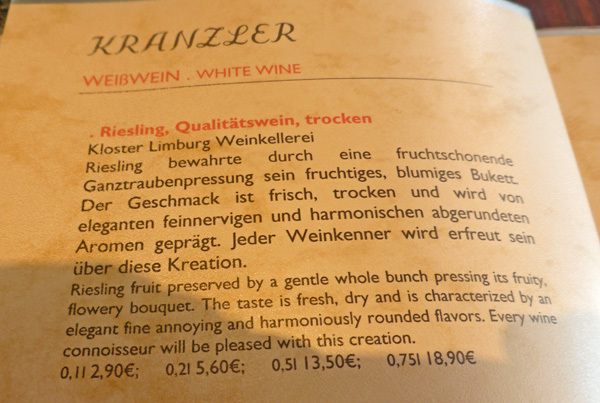 In a chain restaurant high above the Kurfustendamm we read with interest the following description of a white wine, or should that be whine? At least the sommelier was confident that every wine connoisseur would be pleased that a gentle whole bunch had created this fruity, flowery, yet annoying product. The proprietors of an Asian-fusion restaurant back home in Adelaide were just as sure that diners who wanted a poor experience would get it. ADDENDUM: For a recent howler, committed by a teacher of languages, (English not being his first), click here. I'm annoyed, disappointed, and obliterated. Love these language foibles. So many great signs around the world. A classic from Wollongong was FUKU Asian Fusion restaurant but me thinks that was deliberate!